One of the things I quite love about our home is its location. 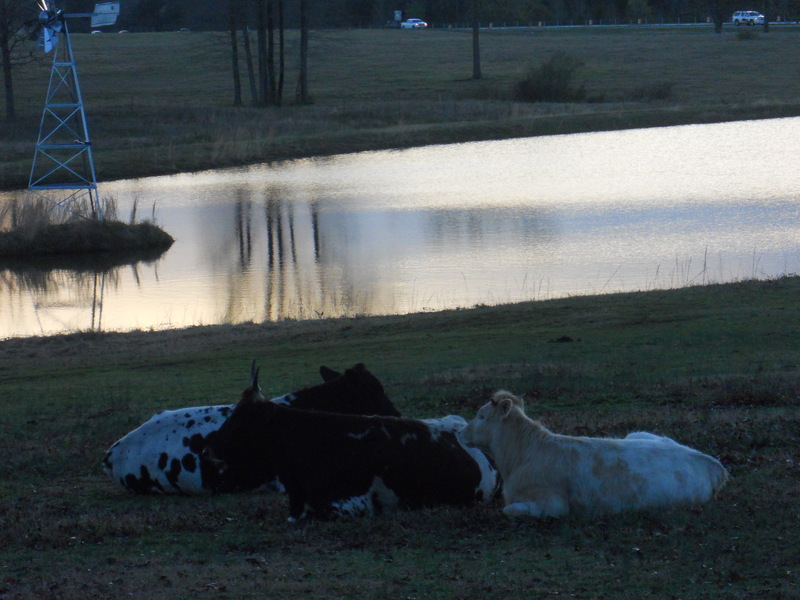 Thirty acres of pasture and woodland and pond grants a world of opportunities to view the lives of both wildlife and domesticated animals. 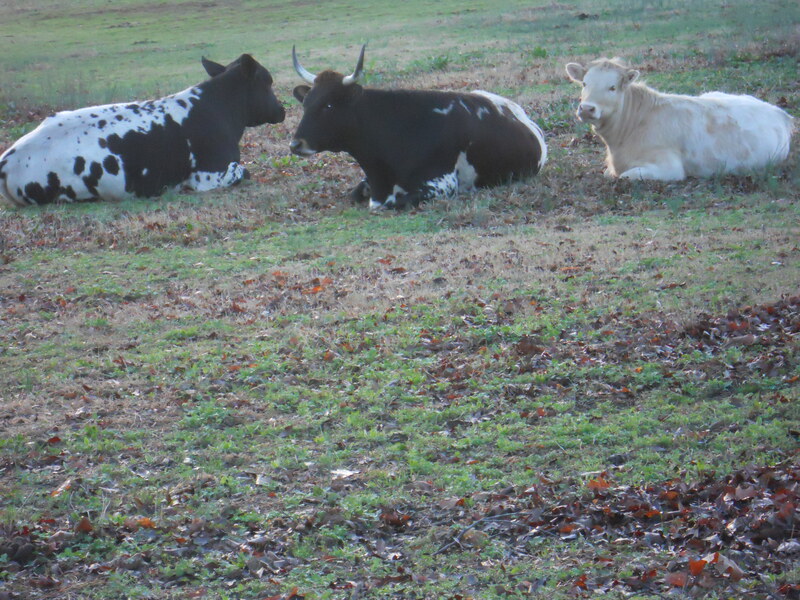 For instance, the above bovine family offers one a bit of a chance to contrast and compare families. In a word, our world is a microcosm of family life across species! You’ll have to forgive me. I fear that my world view is being “Downton-ized”. My daughter and I are latecomers to the community of Downton Abbey watchers, and we have been playing catch-up with the aid of DVDs of each of the previous seasons. We are firmly established in Season III now, and I find myself constantly thinking about the people, the tragedies, the interplay of politics and religion and aristocracy and servanthood. And, one could never forget the family dynamic–sisters who are crushing each other’s dreams, the dowager duchess who is fearless in her criticisms but surprisingly wise and unerringly funny in her comments, the lessons of a marriage made for money yet resulting in love. There is so much to ponder! And that introductory note brings me to the story of Daisy, Holly, and Lily, who are pictured above. A little family history must come first. Daisy is a lovely, longhorn mother who has born two beautiful daughters. She has quite striking brown spots. She was born on this land, and, as a young calf, would come to the fence to get me to feed her the tender grass from my side by hand. (You do recollect, don’t you, that the grass is always greener, sweeter, and more tender on the other side of the fence?) Although her horns look quite intimidating, as well they should, she has a very gentle nature and has been the epitome of a good mother to her daughters. Holly, her firstborn, was conceived through the services of a huge black Brangas (Brahma and Angus) bull. Holly lost the horns, but retained the lovely spots. However, her sire’s contribution to the gene pool resulted in black spots. Holly has been a bit of a trial to us and her mother, as befitting the old term “black sheep” (or cow, as the case may be). I’ll explain shortly. Then we come to sweet little Lily, named thus because at birth she appeared to be lily white with no spots. In the way of cattle, which is not monogamous by any stretch and operates by virtue of proximity and not loyalty, Lily was fathered by a lovely, creamy white, Charolais bull. As she has progressed into childhood and adolescence, she, too, has developed spots, which are creamy yellow, almost like a light caramel or butterscotch. Much to our surprise, she also has nubbins with the promise of developing horns like her mother. I alluded to Holly’s miscreant activities. It began with Lily’s birth. Holly, great grown heifer that she was, long weaned from her mother’s milk, saw the young Lily partaking of maternal nourishment. It seems that the memory of the sweet warmth of Daisy’s milk was not long past in Holly’s memory, and, besides, who was this upstart drinking from the fountain of her mother’s udder? Holly quickly relapsed into infantile behavior, pushing Lily aside and draining Mama` quite empty. And so, Holly was banished to a pen by herself. Fortunately, she learned that lesson, and, when reunited with mother and sister, behaved herself, at least regarding nourishment. However, I presume that her teenage hormones and angst took control, and she recently created an opening in the fence on the backside of our pasture, exiting such and meeting up with a friendly bull there. You can guess the rest. She was duly returned home and, before her captors could get back to the other side of the fence, she again was out, dallying with her teenage crush. Once again, the prodigal was returned to her proper home, this time with imprisonment in the pen of her youth. I say all that, to note this. Arising early one morning, I noted the three of them, lying together where they had rested through the night. And, each morning since then, I have found them thus. And, somehow, in my Downton-ized brain, that struck a chord. Yes, children sometimes disappoint. But, a mother’s love is unconditional and forgiving. And, families stick together. That’s why I love living here. There’s always a lesson in the wonder that surrounds. I hope you experience both the lesson and the wonder of your life today. Previous postWhen the earth gives way……..